It’s already the tail end of December 2014! A year sure goes by fast. Of course, at year-end time there are a lot of celebrations. Not just New Years, but Christmas and other holidays as well! but what those festivities entail does differ a fair bit. So for this last entry of 2014, we’ll take a look at these year-end celebrations: when, where, and with who we celebrate! The theme is “year-end celebrations”, but we do have to get a bit more specific about when those celebrations are. Probably the most common type of year-end party in Japan is the “bounenkai” (literally, year-end party!). Bounenkai don’t have a specific set date, though, rather they can happen throughout the end of the year. In general a bounenkai with friends is planned around when most everyone can make it, but there are also big pre-planned bounenkai events. On top of that, a lot of people will find themselves going to multiple bounenkai over the course of the month. On the other hand, America’s year-end celebrations all pretty much have specific set dates. Obviously the biggest holidays are Christmas and New Year’s. With New Year’s, you can’t really change the date to celebrate or it loses its meaning, and celebrating Christmas early or late isn’t too common either. 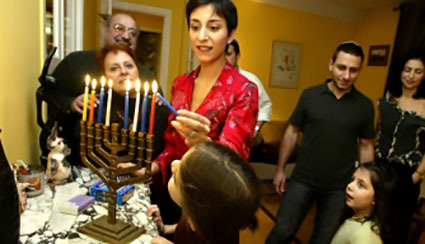 With Christmas being a religious holiday, there are a number of people who don’t celebrate it, but some other religions have big holidays around the year-end as well. Probably the most well-known of these is Hanukkah. The specific days change from year to year, but it’s always an 8-day period in December (sometimes starting in November). For bounenkai in Japan, there are a lot of reasons to hold them, so the places they’re held can vary as well. Izakayas or restaurants are a popular choice, and sometimes people hold them in their own homes. On top of that, bounenkai music events are sometimes held in clubs and other venues! It’s not quite the same as in America, but there is a Christmas in Japan. 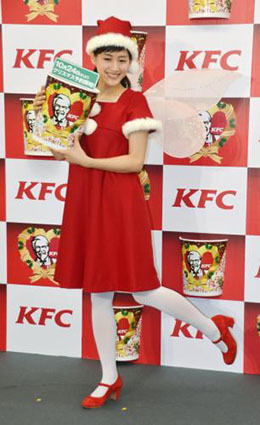 I’m not extremely well-versed on it, but probably the most talked-about thing overseas in regards to Japanese Christmas is KFC Christmas. I don’t know exactly how the two got linked up but, well, there it is. Life, uh, finds a way. For American Christmas, there are various festivities at various places. Again I’m not an expert, but practicing Christians go to church a number of times around the Christmas holiday. 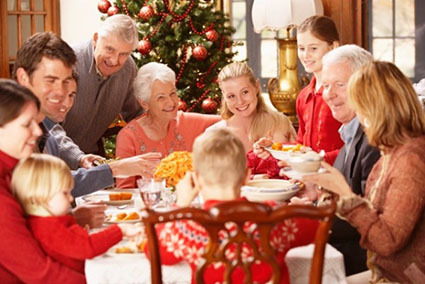 Aside from that, one of the big Christmas things is to gather with extended family at someone’s house, as Christmas is mostly a family-centric holiday. That said, Christmas parties with friends aren’t too uncommon either, especially among young unmarried people like college students. American New Year’s is much more of a party holiday than Christmas. Everyone gets pretty fired up for New Year’s Eve. There are usually tons of parties both at friend’s houses and at clubs and the like. Essentially, the main thing people do on New Year’s Eve is hang out, drink, and party. 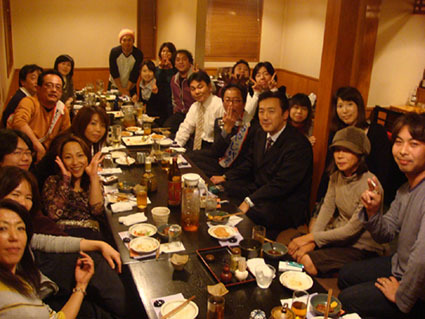 Most bounenkai gatherings are of friends, though company bounenkai are also common. That said, a lot of the time there will be people you don’t know as well, so it’s a great way to make new friends. I do wonder though if/when Japanese spend time with their families at year end. Christmas doesn’t seem likely, so maybe New Years? Obviously I don’t have Japanese family myself, and I’ve actually never spent New Year’s Eve itself in the country, so I’m not really sure. I mentioned it before, but in America, Christmas is a holiday you spend with family. In families with young children, there’s usually a big meal on Christmas Eve and then the kids are put to bed. While they’re sleeping, the parent put their gifts under the tree (and tell the kids it was Santa, if they still believe that). Then when the kids wake up, everyone rushes to gather around the tree and open gifts. That’s the traditional image, at least! The most common thing to do for New Year’s Eve is to get together with friends, but going on a date is also popular. No matter who you’re with, as midnight of the 31st gets close, everyone gathers around the TV (or a clock) and counts down the last ten seconds of the year. The biggest thing to watch on TV is the countdown in Times Square. With everyone watching and counting down together, there’s a great sense of togetherness with the whole country. A New Year’s-themed song from BUBBLE-B. If you watch the video you can get a good idea of traditional Japanese New Year festivities. It’s been another great year, and I wanna thank everyone everywhere for everything!